Cocoa? Check! Coffee? Check! Hmmm...cherries? Check! Check! What was that in the back of my freezer? I found a pack of cream cheese and I knew it was time to crank up the old mixer and preheat my oven to 350 degrees. 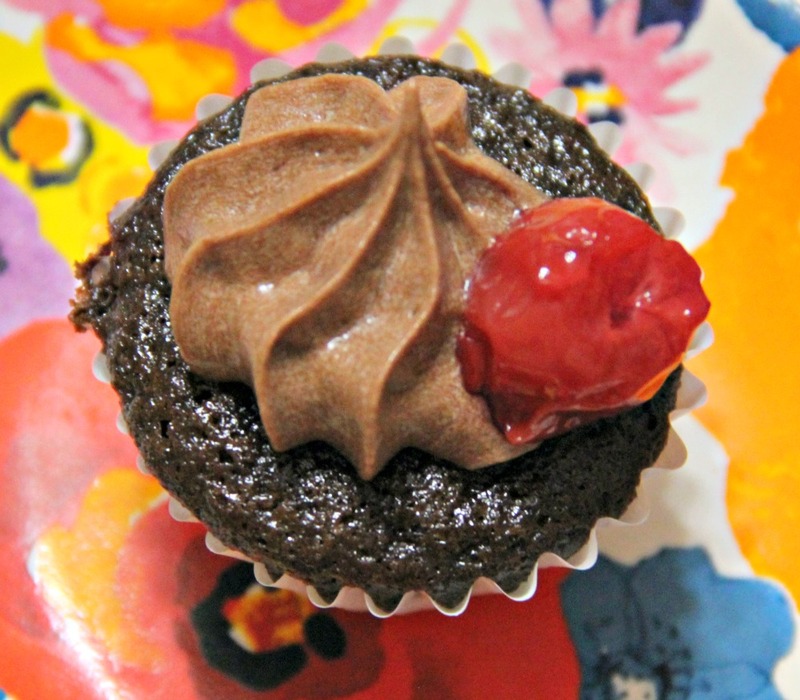 The result were these delicious cherry-filled chocolate mini cupcakes that the entire family has raved over. I love them because at night when I'm desperate for a chocolate fix, but don't want to pay for it with my waistline, I can enjoy one of these decadent little treats without the guilt. 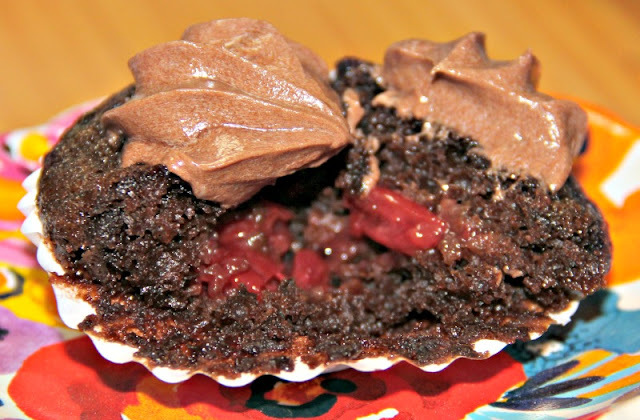 1 large jar Maraschino cherries (drained) or use 1 can of cherry pie filling (drained). You'll want about 72 to 80 cherries total. 2. 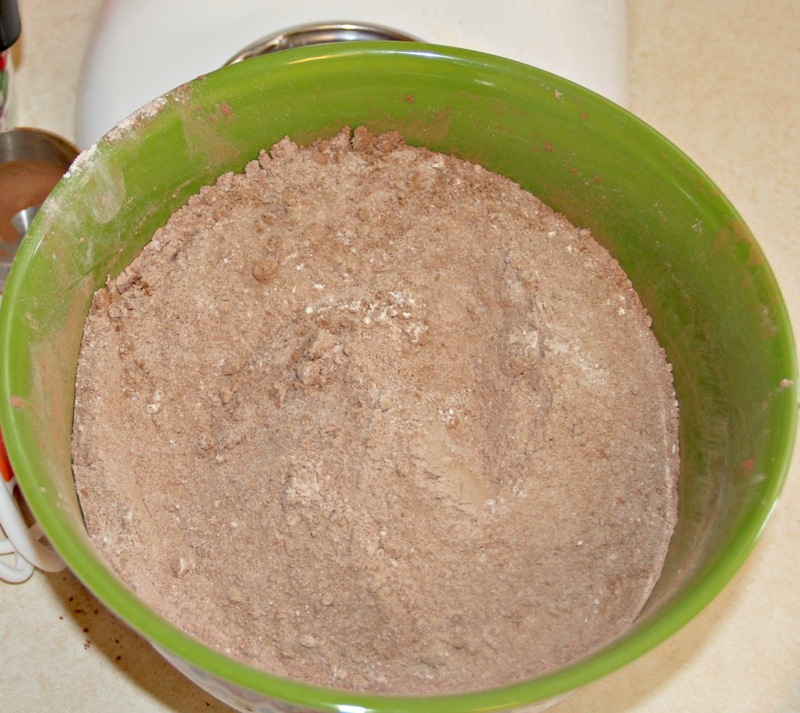 In a separate mixing bowl, sift together the flour, sugar, cocoa powder, baking powder, soda, and salt. Set aside. 3. 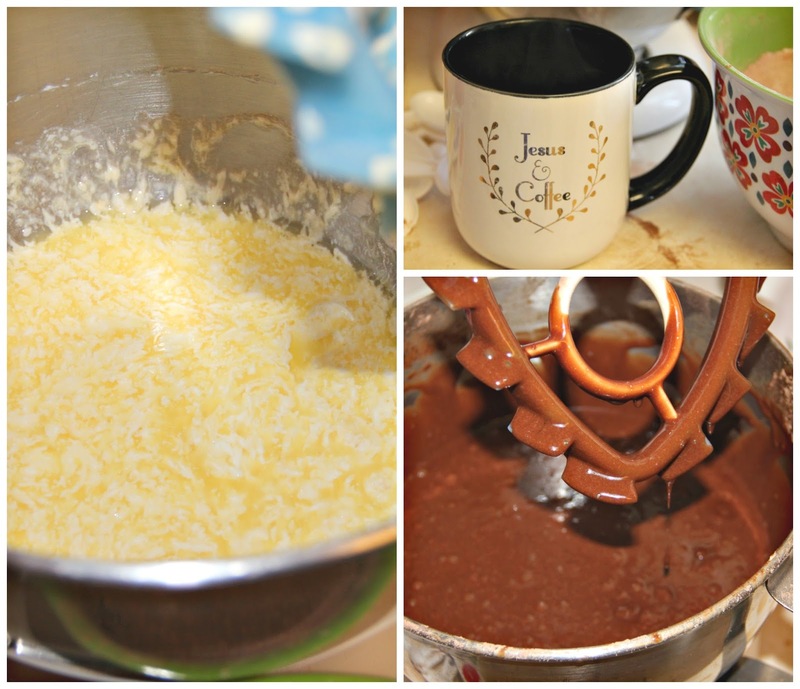 In a mixing bowl with beaters mix together the eggs, vegetable oil, and cream cheese. Kind of an odd looking mixture. I thought it looked a lot like scrambled eggs. 4. Make yourself a piping cup of hot coffee, whatever variety of beans you have is fine just as long as it's not flavored (unless you're really feeling frisky and then give it a whirl and tell me how it turns out!). I'm always looking for a reason to have just one more cup so of course I made extra. With your mixer on the slowest setting add 1/2 of the dry mixture to the egg/oil/sour cream mixture. Next pour in 1/2 cup black coffee, the rest of the dry mixture, and finally the last 1/2 cup of coffee. If you use the "one cup of coffee" setting on your coffee maker you will probably end up with one Tablespoon or two extra (set this aside for the frosting). 5. Place mini cupcake papers in your cupcake pan and fill each one about 1/2 to 2/3 full of the cake batter. Take one cherry and place it right in the center. It will move nicely to the middle of the cupcake as it bakes. 6. Bake in the oven at 350 degrees for 18 minutes. 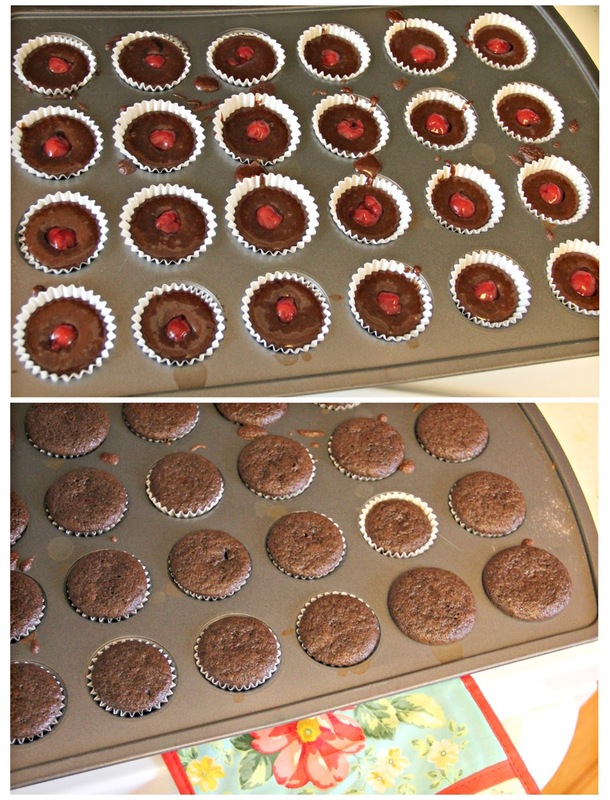 Allow the cupcakes to cool for 2 minutes before removing them from the pans to a cooling rack. Normally when I bake, I set all of my ingredients out well ahead of time so they are at room temperature when I'm baking. This whole snow-ruining-my-first-day-of-spring thing threw me for a loop though and both my butter and sour cream were in the fridge and freezer. I put the butter and cream cheese in a microwave-safe bowl and heated it for 8 seconds, tamped them with a fork, and heated them for another 10 seconds before throwing them into my mixer. With the whisk attachment, beat together the butter and cream cheese until nice and smooth. Add the cocoa powder and mix till it's well incorporated. Next add 1/2 of the powdered sugar followed by the vanilla and coffee. Whip until creamy, smooth, and out of this world delicious! 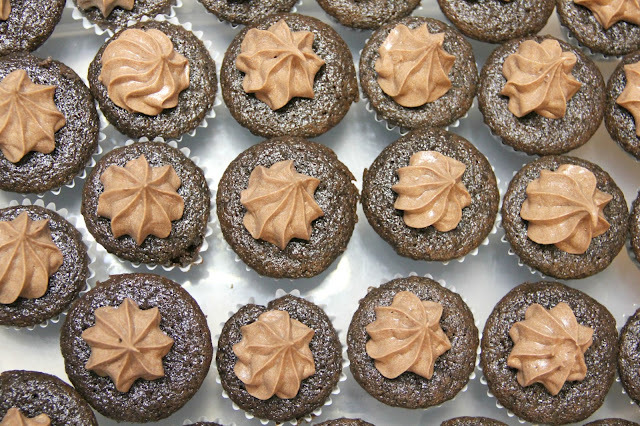 Aside from the fact that I can usually satisfy my craving with one mini cupcake, I love that these little babies cool so much faster than a full size cake or larger cupcakes. which means I can get to frosting and get the entire job done sooner than later. 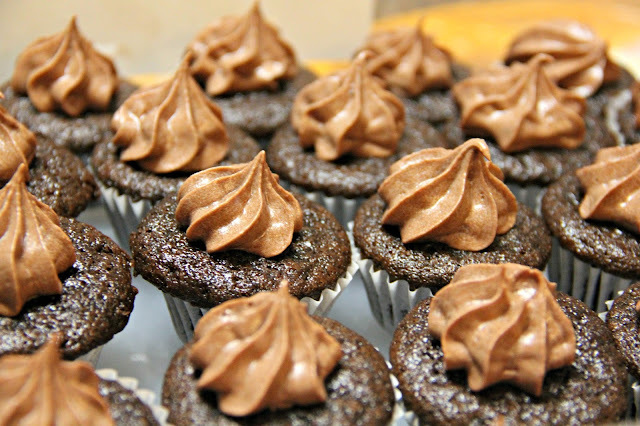 I like to frost my cupcakes with a piping bag and tip (one little flourish and it's done) but you can top them any way you like. 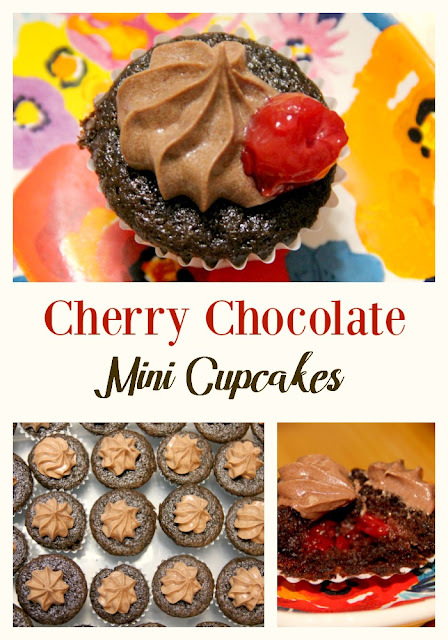 Garnish them with an extra cherry if you want a boost of the fruity tones. Store in the fridge in an airtight container or share the extras with friends and neighbors!